Newport County boss Justin Edinburgh says striker Rene Howe could be back in action sooner than expected after undergoing surgery. The 27-year-old ruptured his thigh muscle during training in August and it was thought he would miss the rest of the season. But Edinburgh says the injury is not "as bad" as "first feared". "We're hopeful now that he will return before the end of the season," said Edinburgh. County have signed Charlton Athletic's Joe Pigott on loan until mid-November as cover for Howe. Manchester United meanwhile want to extend Newport youngster Regan Poole's trial by another week. "They [United] obviously were very impressed because they've requested that they take him [Poole] for another week and play him in a game this time around," said Edinburgh. "We will talk with Manchester United and allow him to do that. "I think it's fantastic for the football club, but more importantly it's a fantastic experience for the boy himself and we'll see where that one leads to." 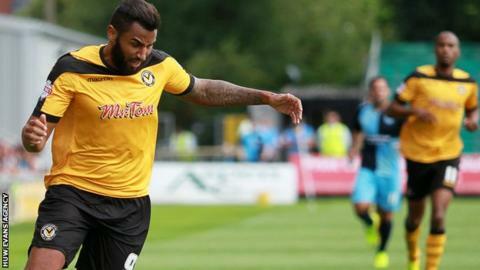 Newport's next match is against Northampton Town at home in League Two on 13 September.